Are you feeling stuck but not sure how to move forward? Do you want to feel clearer and confident in yourself & your decisions? 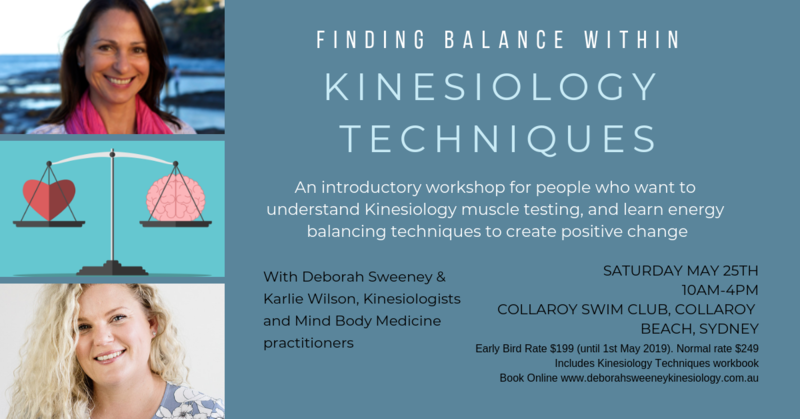 As Kinesiologists and Mind Body Medicine Practitioners we are in the business of transformation, helping YOU feel confident, clear and balanced. Because when you feel good about yourself your life flows, your relationships improve, and life becomes fun again! Deborah & Karlie see the powerful resuts their clients experience every day. Their passion is to bring this life changing technique to you, helping you feel empowered to create balance within. Are you curious about energy healing? Would you like to learn a technique that you can use to reduce stress and feel emotionally balanced? The energy of Reiki encourages balance of your physical, mental, emotional and spiritual bodies, helping you to relax and promote healing & wellbeing. The process of giving Reiki is through “laying on hands” onto the physical body or channelling energy into the Aura. The energy of Reiki is universal life force that is available to everyone, when we use the intention and symbols of Reiki we open ourselves to receive the gifts of spirit, when we do this our life feels more meaningful as we enjoy nurturing ourselves on a deeper level. At the end of the weekend you will receive a personal certificate of completion. The investment is $350, payment is available by paypal, card or cash. If you tick that you're attending I will contact you directly. No experience is necessary to attend just an open heart & willingness to learn. It truly is a life changing step on your spiritual path. I would love to connect with you in person to share this wonderful healing energy with you!